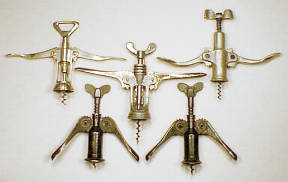 The Double Lever is rather simple to use and can make cork extraction a pleasurable experience. The arms are raised to expose the worm below the frame. 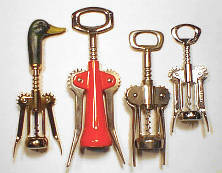 The worm is turned into the cork and by simply lowering the arms, the cork is extracted. 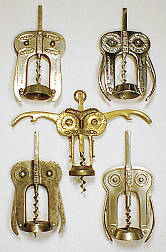 The most common double levers are the brass and chrome plated varieties with a cap lifter in the handle (top row). These are quite often marked ITALY and may have advertising on the levers. Those in the bottom row are a little earlier and more difficult to find. 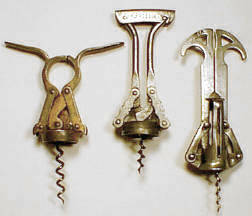 These are all very similar to Dominick Rosati's Cork Extractor Patent Number 1,753,026 of April 1, 1930. Rosati was from Illinois. Similar French Patents were issued to Amedee Desbordes (#647,023 - July 23, 1928), Baptiste Fedrici (#694,610 - September 16, 1930) and Victor Fouque (952,572 - May 2, 1949). The Italian Double Lever at top left is unusual in that it is Silver Plated. In the center is a French Double Lever. At top right is what appears to be a prototype piece. This is cast aluminum and works extremely smoothly. Anyone seen another? The bottom two are the Italian and Argentinian versions of the Eterno. The Eterno is Ettore Cardini's 1945 Italian Patent. 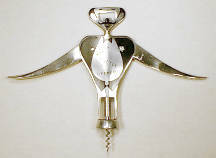 A highly desired Double Lever is the Hootch Owl pictured in the center. This is Richard Smythe's American Design Patent Number 98,968 of March 17, 1936. It is marked HOOTCH-OWL and has the appearance of an owl staring at us. On the backside, one sees two slots at the eyes so the owl appears to be sleeping. The arms also can be used as cap lifters. Smythe also was issued Mechanical Patent 2,115,289 on April 26, 1938 for this type. One should not confuse the Smythe design with the more common chrome double levers with similar appearance. 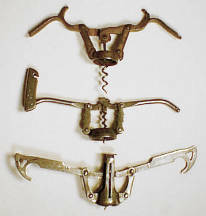 Somewhat difficult is the corkscrew at top left marked MAGIC LEVER CORK DRAWER which is English. A number of other types from Spain, Italy and Portugal have been noted. Markings include LIMSA and BOJ. No they are not Larry, Moe and Curley Joe. The fellow on the left is marked Sommelier and it is Italian designer Aldo Colombo's American Design Patent Number 274,974 or August 7, 1984. In the center is a Monk Cellarmaster with cellar key hanging from his sash. On the right is Bacchus. They are all silver plated. These Italian Double Levers are from the late 50's through early 60's. 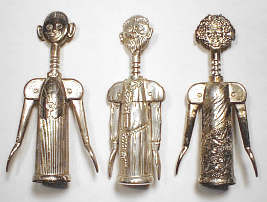 They are aluminum and usually have toasts in several languages on the backside. They are variously knows as the Clown, Barman and Barmaid. The clown is the rarest of the lot. 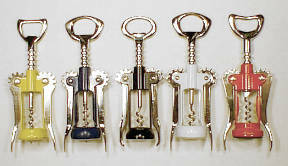 All incorporate a cap lifter in the mouth. Based on Gemelli's design patent (see below). A variation on the above figures. Overall much larger with an apparent misplaced cap lifter! Carlo Gemelli of Italy was granted American Design Patent 184,613 for this on March 17, 1959. The title of the patent is "Bottle Opener." 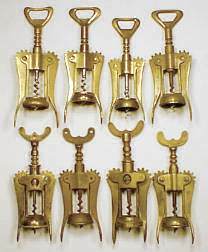 The "A-1" Double Lever (top left and bottom row) was patented by James Heeley & Sons of Birmingham, England in 1888. The Double Lever at top right was an 1880 English Patent by William Baker also of Birmingham. 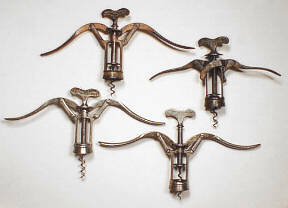 One might consider these as compound Double Lever Corkscrews. On the left is Englishman Heeley's "Empire." This was Heeley's 1890 patent being an improvement on his 1888 patent. In the center is marked GEHA. This is a version of George Hausmann's English patent of 1904. Hausmann was from Kassel, Germany. These are most often marked GOLIATH but are also found with the mark CHAMPAGNE MOËT & CHANDON. 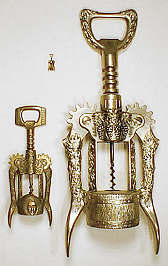 At left is a French corkscrew called the TYR invented by Mme. Veuve Paraf and granted French patent 675,979 on November 18, 1929. At top left is a charm Double Lever. At lower left is the normal size (8") and at right is a giant 15" Double Lever probably used in a point of purchase display. These are Italian designer Cipriano Ghidini's American Design Patent Number 228,613 of October 16, 1973. A colorful collection of modern double levers. And just a few more modern examples. The duck head as well as horse heads and otehrs have appeared in mail order catalogs in recent years. The chrome plated example on the right has a left-hand worm (yes, for left-handers use).